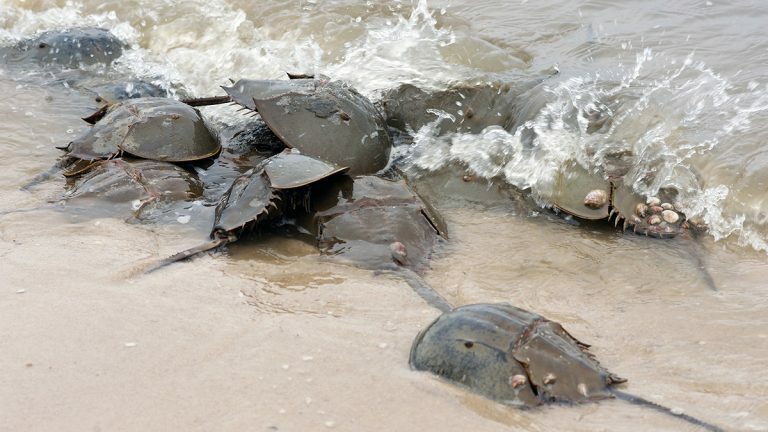 Work will start later this month on rebuilding horseshoe crab nesting grounds on two beaches on the Delaware Bay that lost tons of sand to Superstorm Sandy. The work follows positive results at five beaches replenished after the 2012 storm, when wind and waves destroyed about 70 percent of horseshoe nesting grounds. Eighty to 90 percent more eggs were laid on the replenished beaches as compared to unrestored beaches hit hard by Sandy, according to project leaders. Nesting rates at restored beaches were marginally better than at beaches considered largely unaffected by Sandy. The American Littoral Society and the Conserve Wildlife Foundation of New Jersey led a coalition of conservation groups to replenish the beaches. “The project is showing us that we can really be successful at helping to bring both the horseshoe crab populations and these threatened shorebirds back,” said the American Littoral Society’s executive director Tim Dillingham. Overharvesting in the 1990s drove down horseshoe crab numbers in the Delaware Bay. That led to declines in the now-threatened bird the red knot, which feeds on crab eggs during migratory stopovers. Fearing another major blow to both populations if crabs were unable to nest during the spring of 2013, conservationists jumped to restore four New Jersey beaches in the months after Sandy. Independent wildlife biologist Larry Niles, hired by the conservation groups to work on the replenishment, said it was not clear at the time if the project would work. According to Niles, crab egg numbers ended up being higher in the spring of 2013, after Sandy, than in the year before the storm. Conservation teams will rebuild three additional beaches next year.